A Wollongong SME has signed a teaming agreement with a LAND 400 Phase 2 contender to develop and produce high performance armour steel for the project and other global customers. Bisalloy Steel Group has engaged with Rheinmetall Defence Australia on the development and qualification of BISALLOY Armour steel products for use on Rheinmetall’s BOXER Combat Reconnaissance Vehicle (CRV) for Phase 2 of the Australian Army’s multibillion-dollar LAND 400 program, if it is selected the successful tenderer. Managing director of Rheinmetall Defence Australia Gary Stewart said the development project had been successful, and the BISALLOY Armour steel will now become another Australian product in Rheinmetall’s Global Supply Chain. "Bisalloy’s capabilities have not only created the best possible protection for Australian soldiers but also a significant export opportunity for this leading Australian manufacturer," Stewart stated. "We welcome Bisalloy to the Rheinmetall Land 400 team and we look forward to building a long-term relationship that further establishes the company offshore." As Australia's only manufacturer of high tensile and abrasion-resistant quenched and tempered steel plate used for armour, structural, protection and wear resistant steel applications, Bisalloy's CEO and managing director Greg Albert said the company had a long, collaborative association with the Australian Defence Force. BISALLOY Armour steel has become a leading product for defence applications in Australia and abroad and is specified for hulls in Armoured Personnel Carriers (APC), Light Armoured Vehicles (LAV), Collins Class submarines and the Bushmaster Infantry Mobility Vehicles in Australia, along with APCs and LAVs worldwide. "For 25 years, the Bisalloy story has been one of working in partnership with Australian steel producers, defence scientists and engineers, international organisations and manufacturers of military vessels and vehicles to produce what we believe are some of the best armour plate products in the world," Albert said. "Bisalloy is proud to now be partnering with a globally credentialled company such as Rheinmetall and we are looking forward to working together in a long-term and mutually beneficial relationship. “Bisalloy has been representing the quality of Australian manufacturing and products on the world stage for decades and we are extremely pleased to be engaged in a project that does the same while also protecting Australia’s fighting forces." The agreement was signed recently at Bisalloy’s operations base in Unanderra, NSW, with Bisalloy joining a network of SMEs including: Melbourne-based Cablex, Burnie-based Direct Edge, Brisbane-based G&O Kert, Melbourne-based Hilton Manufacturing, Perth-based Hoffman Engineering, Melbourne-based Nezkot Precision Tooling and Engineering, Adelaide-based Plasteel and Adelaide-based Redarc. The SMEs will be included in the Rheinmetall Global Supply Chain, enabling each to export their industry leading technologies globally. The network of SMEs is a fundamental part of Rheinmetall’s offer to the Commonwealth for the LAND 400 Phase 2 project. Rheinmetall said the network will drive new infrastructure in the form of a Brisbane-based Military Vehicle Centre of Excellence (MILVEHCOE) to supply, support and sustain thousands of Australian military vehicles delivered under the Land 121 and Land 400 programs and regional Rheinmetall vehicle fleets within the south-east Asian region. 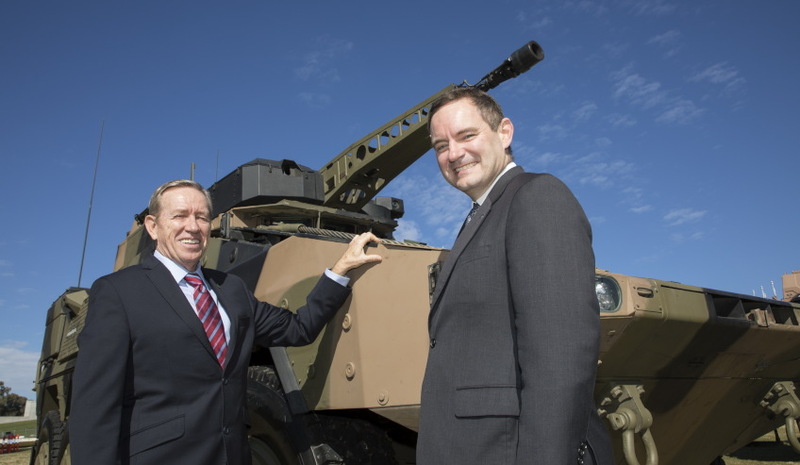 Rheinmetall also recently announced it will establish research programs with the CSIRO and universities, as well as establishing an $80 million Technology and Product Development Fund as part of the Australian Industry Capability program for LAND 400 Phase 2. With an initial investment period of five years, Rheinmetall will use the fund for research in future technologies, and ongoing product development. Defence will buy 225 CRVs costing $4-5 billion from either Rheinmetall or BAE Systems Australia for LAND 400 Phase 2. Testing of both contenders' vehicles recently wrapped up, with a decision on the project expected next year.